On Sunday morning, multiple police officers were shot in Baton Rouge, Louisiana. At the time of an initial report, officials confirmed that multiple officers and the shooter were presumed down and that the scene had been contained, according to CNN. Later in the day, police officials confirmed that three officers had been killed and three others were injured, for a total of six officers shot. Local news station WAFB in Baton Rouge reported that the incident occurred on Airline Highway near Old Hammond Highway. Officers were near a B-Quik convenience store in the area. In response to the incident, officers asked members of the public to stay out of the area, and a portion of Airline Highway was closed. According to NBC, the East Baton Rouge sheriff's department described Sunday's shooting as an "ambush attack." The department suspected that multiple gunmen were involved. One suspect had been killed, but two others were believed to be at large. Following the attack, officers were stationed at the medical center where the police victims were being treated and near the police department's headquarters, which is located on Airline Highway near the scene of the incident. A spokeswoman from the medical center told USA Today that one victim was in critical condition and one was in fair condition. 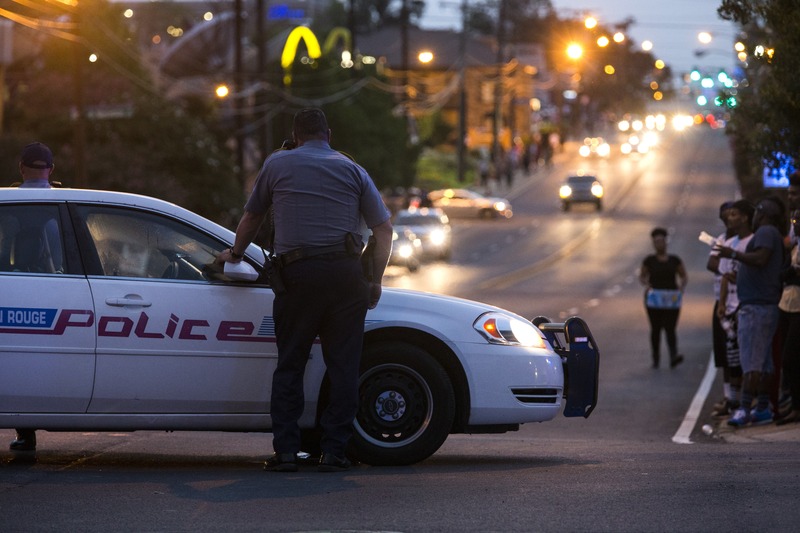 Tensions between police and civilians in Baton Rouge have run particularly high since the shooting of 37-year-old Alton Sterling earlier in July. In that incident, police shot and killed the African-American man while responding to a call at a convenience store in the area, the Triple S Food Mart. Following the shooting and the release of video footage showing the incident, there were several days of protest in Baton Rouge and across the country. It was unclear on Sunday if the day's shooting had anything to do with Sterling's shooting. In a statement, President Obama condemned the shooting and showed his support for the Baton Rouge police department. "These are attacks on public servants, on the rule of law, and on civilized society, and they have to stop," he said. He vowed to seek justice for the fallen and wounded officers. Throughout the day, news of the attack dominated social media, with users expressing their sorrow and frustration over Sunday's attack and the other recent acts of violence that have been committed between police and civilians. Some individuals also responded to the attack with ways to help, including a GoFundMe page and a CrowdRise fundraiser. The investigation into Sunday's incident will continue — and the search for the remaining suspects will go on — but with any luck, the violence will soon end.